Choose suitable varieties. Valley weather is most noted for its hot, dry summers. Good choices for this climate include Ace, Ace 55, Better Boy, Burpee VF Hybrid, Lemon Boy and Early Girl (all main season tomatoes); Beefmaster, Big Beef, Supersteak and Whopper (big-fruit varieties); Juliet, Roma VF and San Marzano (paste tomatoes); and, Patio Hybrid, Sweet 100, Sweet Million, Sun Gold and Sun Sugar (small-fruit varieties). All of these were taste test winners, in trials conducted by the Master Gardeners of Sacramento County since 1999. Heirloom varieties include Brandywine, Old Brooks, Arkansas Traveler, Dad's Mug, Anna Russian, Aunt Ginny's Purple, Dr. Lyle, Dr. Neal, German, German Johnson, Mortgage Lifter, Pruden's Purple and 1884. Favorite heirlooms in our garden over the years have been Dr. Wyche, Kellogg's Breakfast, Marianna's Peace. Catalog sources include Tomato Growers Supply Company and Totally Tomatoes. Using home-saved tomato seeds. 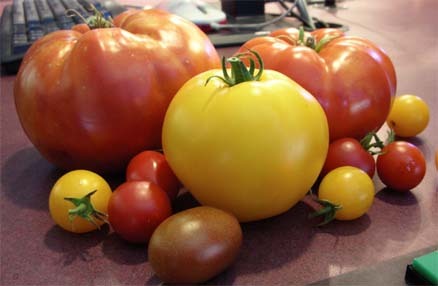 If you want to save seeds of a particular tomato variety, remember that many varieties are hybrids; they may not necessarily come back with the same traits as the tomato you enjoyed last season. Open pollinated or heirloom tomato seeds are fine for saving, as long as they are grown 30 feet away from any other varieties. For best results: save the seeds from tomatoes that are overly ripe; rinse off as much of the flesh and protective gelatinous coating from the seeds as is possible. Then, soak the seeds in a jar of water for a couple of days to remove the rest of the coating. The seeds will sink to the bottom, the gel will float. Discard the gel, remove the seeds and let dry on a paper towel. Then, store in an airtight container in a cool, dry location. Start seeds early. January and February are the best months for starting tomato seeds. This will allow 8-12 weeks for the plant to get off to a good start in a warm, sunny place, such as a south or west facing window. It usually takes 7-14 days to germinate tomato seeds. To test for viable seed that you've been saving: moisten a coffee filter, and place a few seeds in the filter, with space between the seeds. Place the filter in an old yogurt container, cover it, and place in an area out of direct heat. Check every few days to see if seeds have sprouted. Movin' on up. When two or three sets of true leaves develop on the tomato seedling, you can transplant it to a bigger pot. This is especially helpful if you started your seeds in a flat or in a small peat pot, or the young stems are bending toward the light at a sharp angle. When transplanting to a bigger pot (preferably a 4-6 inch pot, but no larger than a one gallon container), prepare the new pot the same as before. However, don't fill the pot as full. Place the tomato seedling, with as much of the original soil as possible to avoid disturbing the roots, into a 1/3 to 1/2 filled pot. Then, add moistened soil mix all along the stem, up to the bottom set of leaves. If you are growing tomato seedlings in a flat, thin them out so that there are six inches between plants. This will lessen the chance of root entanglement and damping off, a fungus disease that kills young seedlings. Mid-Spring is Tomato Planting Time. Plant tomato transplants when the soil has warmed enough to keep the plant actively growing. Around here, late April or early May is the optimum time to set tomato plants outdoors, unprotected, in a garden area that gets full sun. If you can't wait that long, protect those tender young plants with hot caps, row covers or "Walls of Water" - plastic, cone shaped enclosures that are filled with water which collect heat during the day, slowly releasing it at night. Fertilize regularly, but sparingly. Feed the plants using a fertilizer that lists tomatoes or vegetables on the label. Follow the label directions; do not overfeed. F: Resistant to fusarium wilt.